1 Brandts Harley-Davidson, Inc. Wabash, Indiana. manufacturer of valve actuation solenoids, stators and molded coils. John Deere dealership in Wabash. Features inventory, location, and product lines. Helps small to medium-sized business convert customers into evangelists for their products and services. manufactures truck trailers, and custom equipment solutions for freight transportation over both highway and rail. manufacturer of custom and standard power transformers for domestic or international equipment such as industrial lighting, metering and general pc board applications. Local bank provides banking services from its branch locations in Wabash Valley, Indiana. Manufacturers of plastisol coated site amenity and furniture including benches, tables and chairs, sandboxes, swings, tree grates and basket trucks. Manufacturers custom plastic injection molded components and provides assistance by participating in design of custom parts before the modular tool making process. Movie theatre popcorn, poppers, seasonings, and nut and coffee gift baskets. Includes recipes. Provider of spices and blends. Site also offers a recipe exchange. Certified in watch and clock repair, offering in-house services on all timepieces. 'The Hot Shots' girls basketball from Indiana. Newsletter, fixture card, staff, social activities, and history. Nebraska and Iowa. Provides state tournament information, photos, and team ranking. From Wabash, Indiana, this Ramp/Street riding site is complete with pictures, news, links, and bike setups. Provides eye care for the entire family. Lasik procedures, optical services and cosmetology. Vincennes, Petersburg and Washington, IN. Attraction for the area. Includes information about the steam train rides, some history, and hours of operation. General information and history, services, news, staff, employment opportunities and links. Located in Mount Carmel. General information and history, services, news, staff, employment opportunities and links. NHRA sanctioned, 1/8 mile, asphalt, dragstrip located in the Vigo County Fairgrounds in Terre Haute. Includes race results, schedule and point standings. Meeting schedules for Terre Haute and surrounding communities. Provided by the Wabash Valley Intergroup. Offers a location for gamers to play popular games online or on the local network. Located in Wabash, Indiana. 40 Bachelor Creek Church of Christ Wabash, Indiana. 44 Emmanuel Free Will Baptist Church Wabash, Indiana. Wabash, Indiana. History, mission statement, ministries, Christian School, services, map, calendar and how to become a Christian. Welcome, informal worship, traditional worship, Sunday school, youth news, activities, bible study, staff, map, who we are. serving clay county and the wabash valley. site describes services offered, staff background, and firm philosophy, also provides stories and obituaries, online memorials, and grief support resources. official site for the wabash valley/illiana area band. with brief background, pictures and links. SiteBook Wabash City Portrait of Wabash in Indiana. 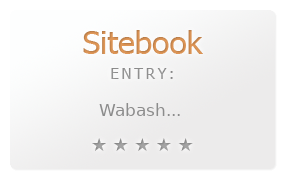 This Topic site Wabash got a rating of 4 SiteBook.org Points according to the views of this profile site.